Review: A nanny gets a job to look after a cold banker’s family. I know people aren’t going to believe what I am going to say but for me I am afraid that this just didn’t do anything for me. It is a film everyone has to see though because it is such a classic film. I can see why people like it so much. It is too over rated for my liking. If I had to choose between this and The Sound of Music I would choose The Sound of Music as it meant more to me growing up. 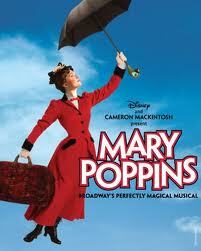 At the Academy Awards in 1965 Mary Poppins won 5 Oscars. They were Julie Andrews for Best Actress in a Leading Role, Best Effects – Special Visual Effects, Best Film Editing, Best Music – Original Song and Best Music – Substantially Original Score. At the Bafta Awards that same year Julie Andrews won Most Promising Newcomer to Leading Film Roles. Julie Andrews also won a Golden Globe Award for Best Motion Picture Actress – Musical / Comedy. It took about two and a half years to do the planning and composing of the songs. The author of the book went to the premiere and walked out half way through she hated it so much. In the movie there is a scene where all the toys come alive. This was later cut out as it seemed too scary for children. For this film Julie Andrews wore a wig. This is on Barry Norman’s list of 100 Greatest Films of all time that he produced at the start of 2012 in the Radio Times.